Today’s Craft Project Central project is designed by Buffy Cooper. 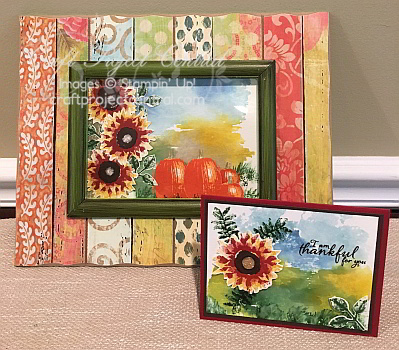 Fall is here, and Stampin’ Up!® has some amazing products to help you create beautiful autumn cards, home décor items, gift packaging and more. In this tutorial, you’ll create a beautiful home décor piece using the Painted Harvest and Gourd Goodness Stamp Sets from the 2017 Stampin’ Up!® Holiday Catalog. You’ll also learn how to create a simple water colored background and discover a new way to use household products with Embossing Paste. This set would make a perfect housewarming or hostess gift, and would be a fun stamp camp project as well. If you would like to learn how to make this project, you’ll want to subscribe for the month of September. With your subscription, you’ll get illustrated, step-by-step instructions for five wonderful projects for only $10! You can find out how to gain access to a bonus sixth project over at Craft Project Central.